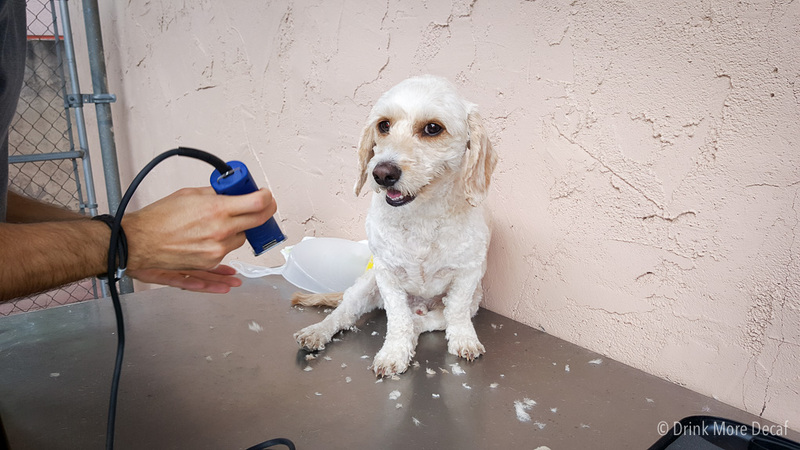 One of the challenges we’ve faced while living in an RV – with a dog – is keeping up with Frodo’s massive grooming needs. He’s part poodle, which means, his hair grows by the minute. Which is of course, one of the reasons he’s named after a Hobbit… But anyway, I digress. Frodo could really use a full haircut every 2 weeks, but we tend to stretch it out to once a month. When we lived in a house, we groomed him while we sat on the floor of our bathroom. It wasn’t comfortable for us, but it worked out well enough. While living in the RV, we groom him in the hallway and vacuum the hair as we go. By the time we are finished (almost 45 minutes later), we both have a lot of body aches and have trouble walking any other way than hunched over. It’s definitely a challenging experience. 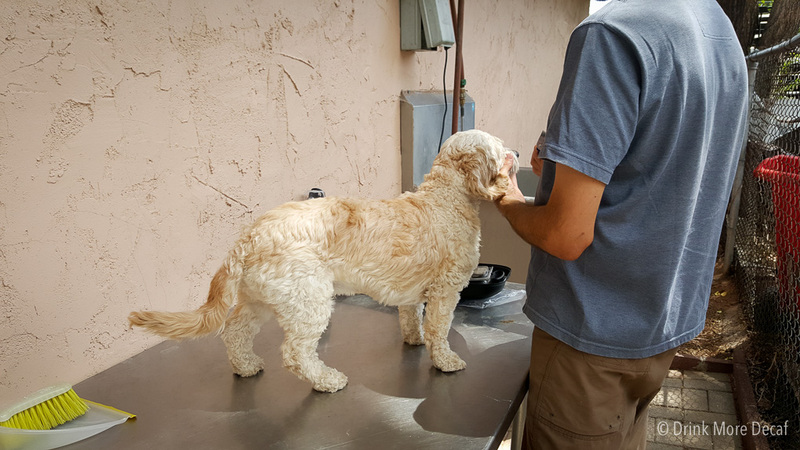 Today, we had the pleasure of grooming Frodo while standing up! Meaning, Dave and I were able to stand the whole time! It was… leaps and bounds easier! Here’s a quick “Before” glance as the grooming was just getting started. The trimming has already been underway here, but he’s still quite the furry beast. Almost an hour later, our Puppy is reappearing! What a difference an hour makes! Seriously, what an amazing experience. 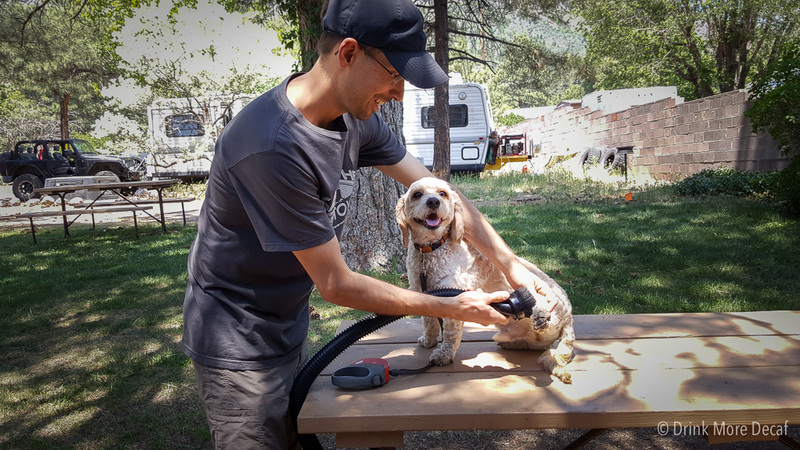 I wish every RV Park would provide a dog grooming station! It’s a little thing that is actually an enormous thing. Not only does this RV Park have a grooming station, they put thought into how they arranged it. It’s outside, but shaded, off to the side, and gated. Because it’s off to the side, we were not able to see foot traffic of people walking round. It’s really it’s own secluded area, which is GREAT when trying to avoid distractions while grooming. There’s a table, electric outlet for clippers, and a wash basin. I see a real bath in Frodo’s near future! 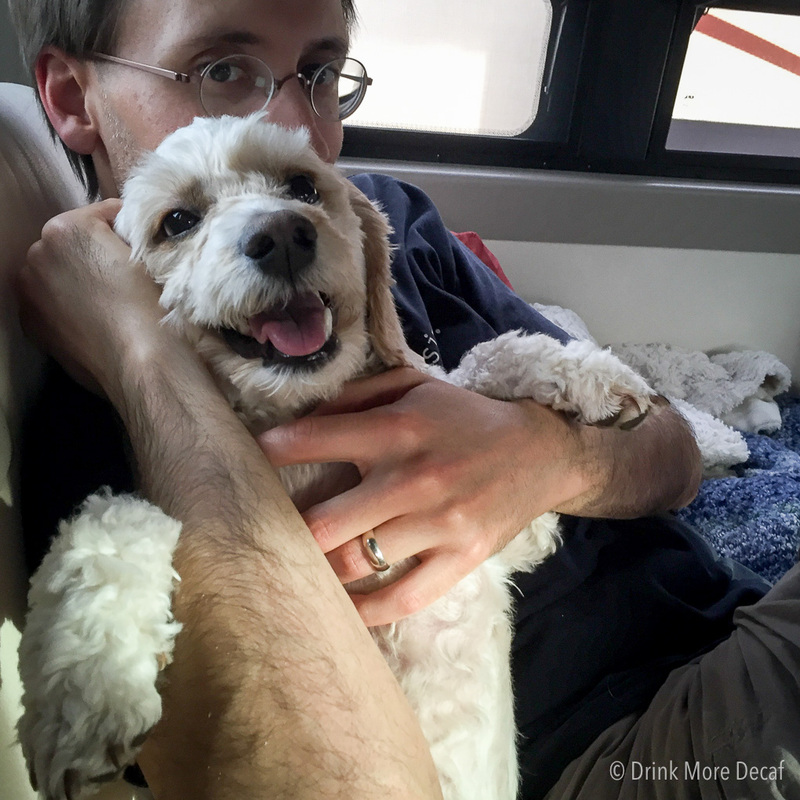 Special thanks to J&H RV Park for being such an awesome place for dog owners! We really appreciate it! What – Don’t You Vacuum Your Dog? Usually when we get back inside after being out, we simply wipe Frodo’s paws with a dry towel, leave our shoes at the door, and we’re good to go. Sometimes we have to use some water on Frodo’s paws if the dry towel isn’t enough. 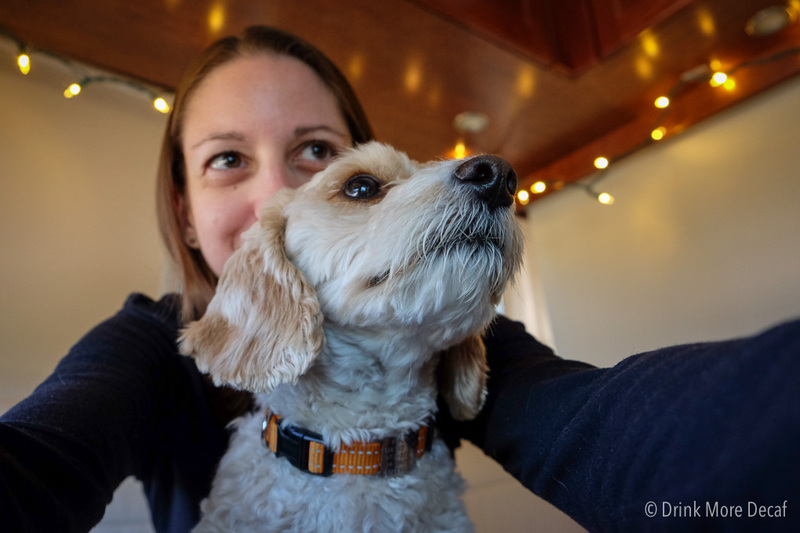 However, the last few days we’ve been at the Flagstaff KOA (in Arizona) which has made things extra challenging from the “traveling with a dog” perspective. This park is just… dirty. Yes, it’s a park, but, it’s a very dirty park. It’s mostly dry sand – everywhere. And sand loves to hide in paws and fur. Current Location: Flagstaff, Arizona – Elevation 6,910 feet. 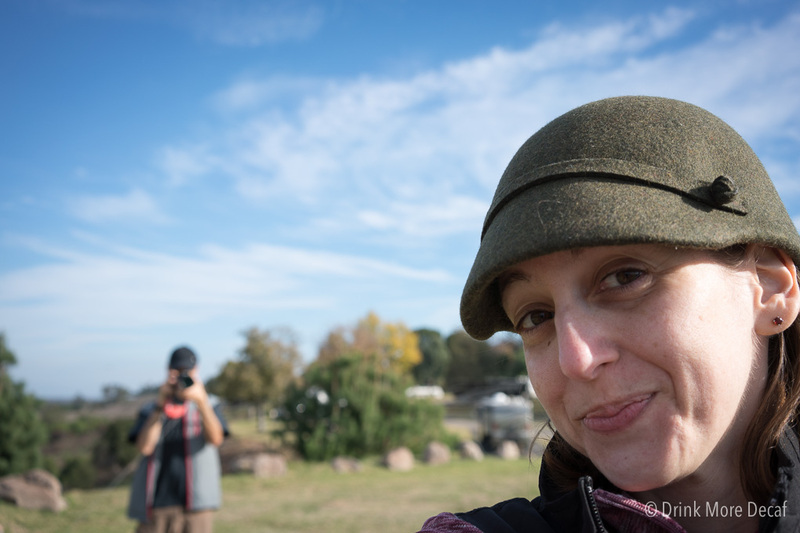 And as I’ve mentioned in the past, I like to attempt selfies – which isn’t that easy with a traditional camera. Less so with a wiggly dog in my lap. But sometimes the shots turn out to be priceless. I love our cozy living room lighting (then again, I love our cozy van)! Does your dog tap the fridge to request peanut butter? Yes, Frodo is very spoiled. But he’s also well trained! Since Frodo has a lot of issues with allergies, he frequently gets peanut-butter-topped-benadryl. What, you didn’t know this was a thing? It’s a thing. Trust me. When it’s time for benadryl, all it takes is one of us getting the bottle out of the cabinet and he runs to us and sits down, eager to enjoy it. We made tapping the fridge and “finding” the peanut butter part of the game, so he’s thrilled to have his medicine. No, we STILL haven’t made a video tour of our van, but this is a glimpse of what it’s like to live in a comically small living environment. Our bathroom is indeed, comically small. Yes, that is the shower, and behind the curtain is the toilet. During a shower, the curtain is pulled across the doorway (where Frodo’s head is in the photo) to keep the water inside the shower. This means the toilet lid and base are in the shower, and not protected from the water like the photo shows. 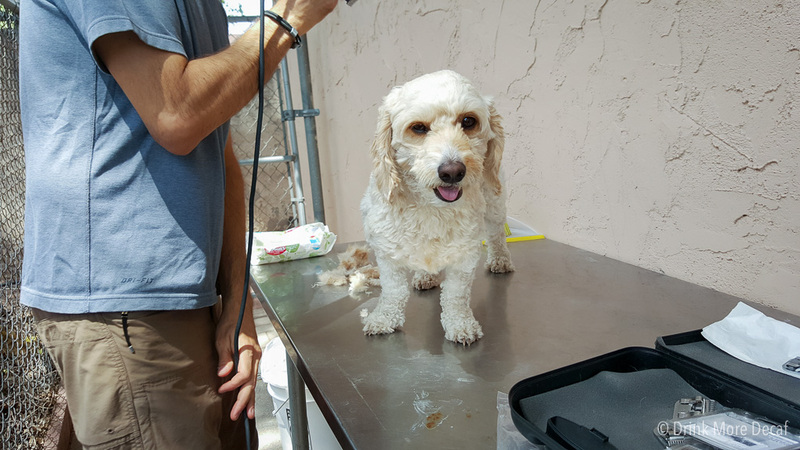 We did that today to make Frodo’s bath less work by skipping some of the post-bath/shower squeegee time. Our bathroom is what is known as a Wet Bath – when everything you need is in one space – and it all gets wet. On the PRO side, the area around the toilet gets a bath every day preventing those super scary dust bunnies that would otherwise grow there. On the CON side, you have to learn to be careful in the shower or you’ll bruise your knees! Today was a very long overdue bath for Frodo. Er, shower. He kind of had a shower. 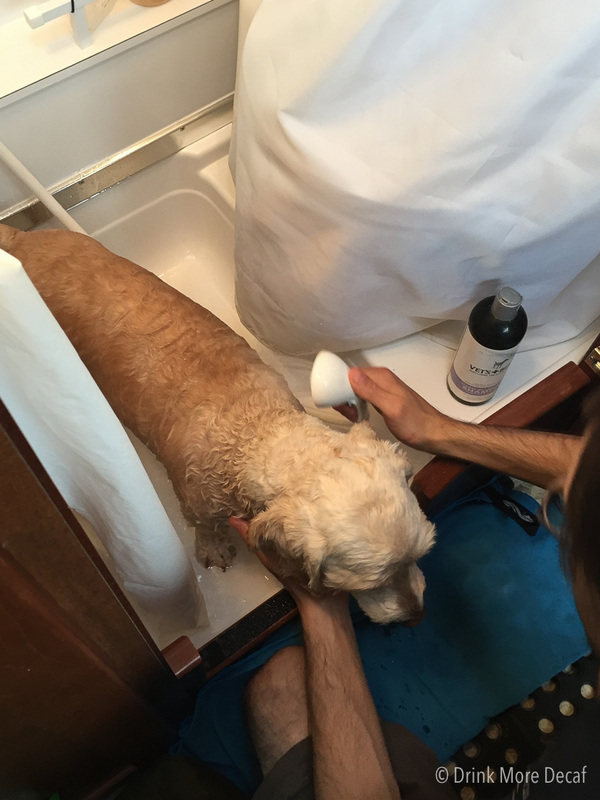 Frodo doesn’t mind the micro-bathroom, and the end result is the same – he is now clean again – yay! 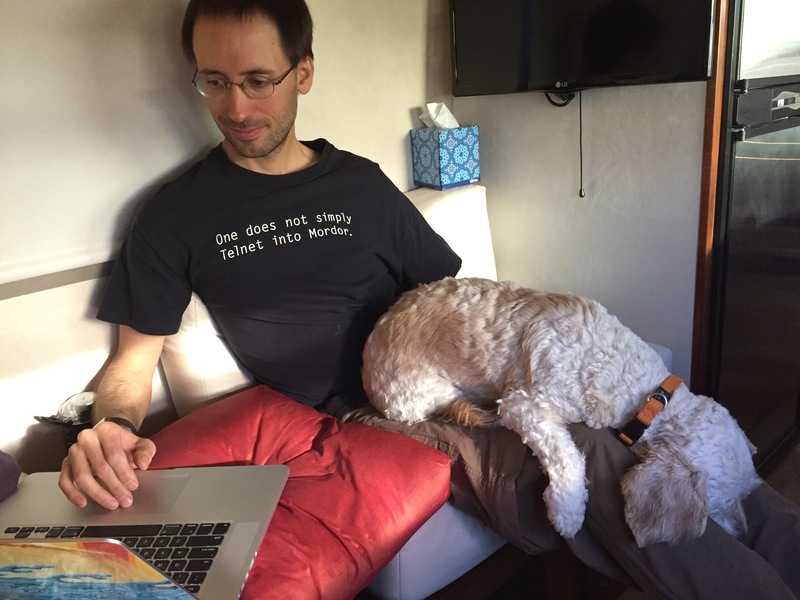 Those of us who have both a Laptop and a Lapdog understand this conflict. The lap has room for only one. Because we chose to live in a 22′ van, we simply can’t have everything with us we want – like a tripod. 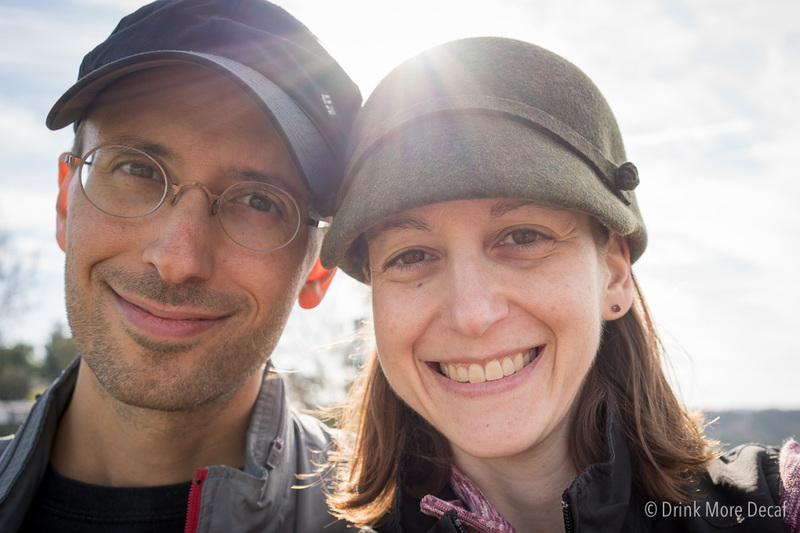 This adds complexity to the fact that I really want more photos with BOTH of us in the actual photo. Challenge accepted. 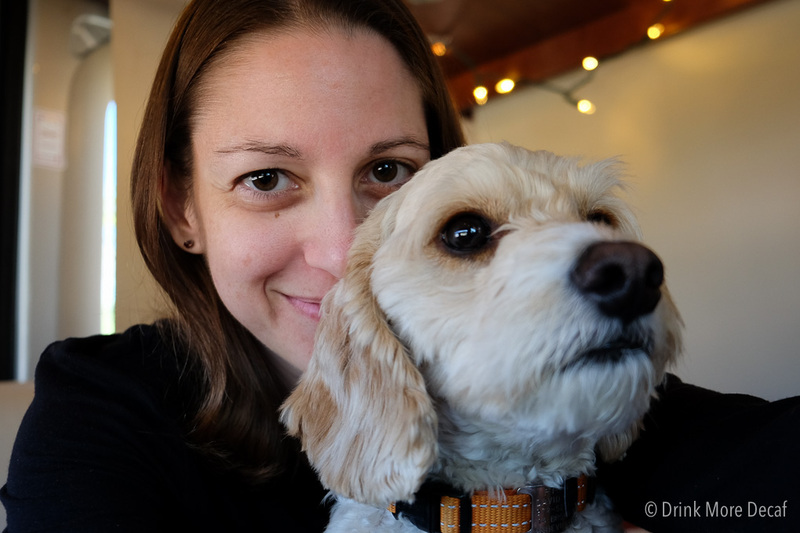 I told Dave I could take a selfie with my 35mm lens, no problem at all. He had the nerve to doubt me. Yes, I really did take this photo holding the camera backwards, composing it blindly. 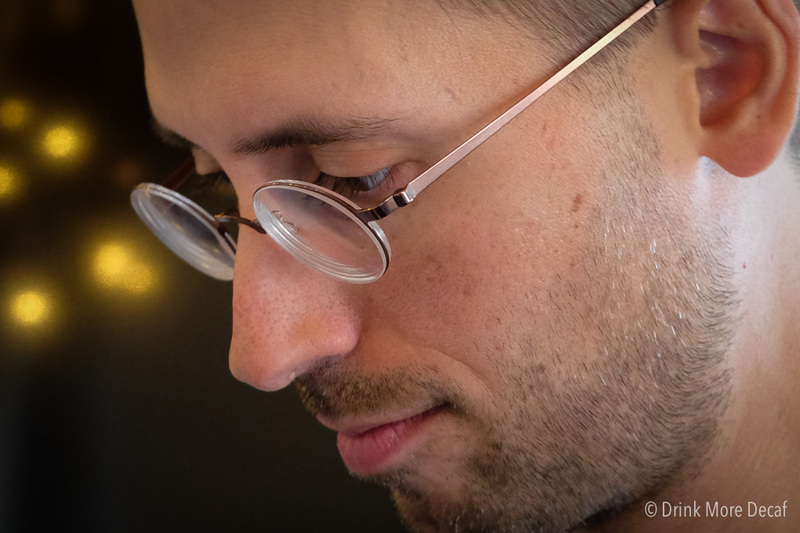 For anyone curious, here is a behind the scenes photo taken by Dave (the boring way, with the camera facing frontwards). And no photography outing is ever complete without a photo of Frodo. Though I think I prefer Arizona over California (so far), Frodo just can’t seem to hold still if there’s grass under his feet. He is really digging California for that reason. He must run and play! 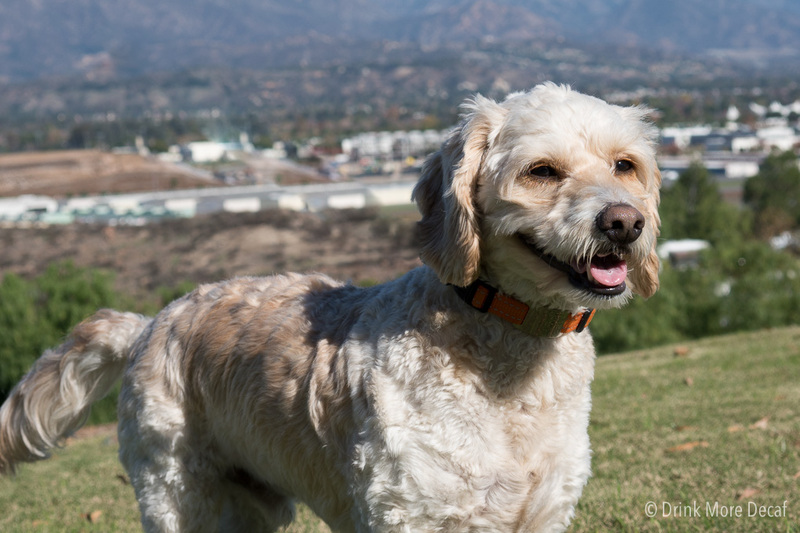 Frodo likes to play like no one is watching… as he should! In all seriousness, it was great to get out today and play. I have my ups and downs with Gastroparesis and the last few days have been pretty rough and a bit painful. But today, today was a good day. And that makes me happy. 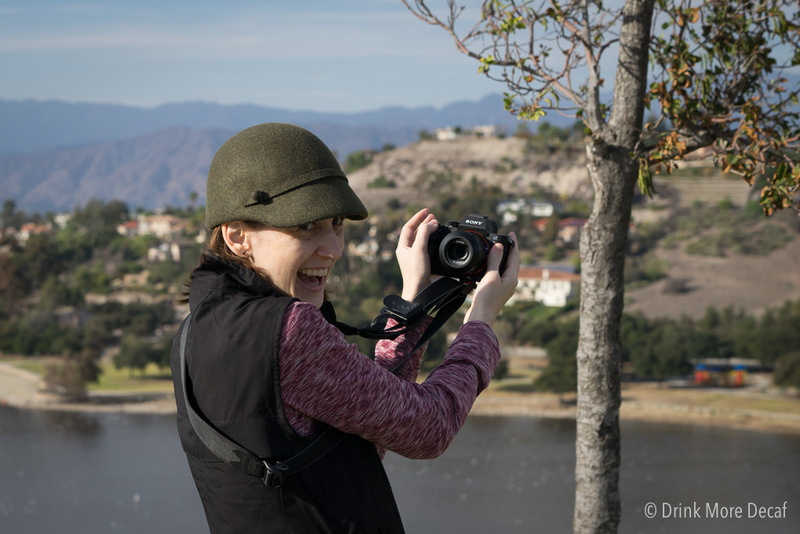 Today we are in San Dimas, California. We’ve been in Chino, California for about a week now. The day we arrived I had planned to blog about our trip, knowing if I don’t write immediately – it won’t happen. Well, obviously, it didn’t happen. I took photos the moment we arrived, but the park where we were staying was, well… horrible. Sure, it looks pretty, but looks aren’t everything. 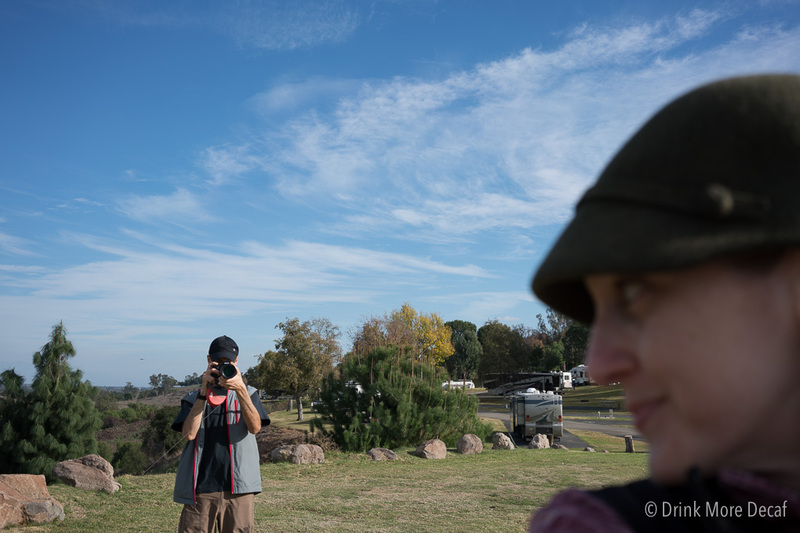 This is where we’ve been for the last few days, Prado Regional Park in Chino. What you can’t see in the photo is the experience, photos don’t tell you the whole story. The park is about a mile away from an outdoor olympic shooting range, and gunshots are heard from just prior to sunrise and continue past sunset every day. Three days a week the range is open for 12 hours and we were treated to gunfire sounds for more than 12 hours during those days. It was lovely. Frodo was usually able to be outside just long enough to do his business but he was quite the unhappy dog while we were there. Walks barely happened, he would get too freaked out (understandably so)! In addition to the sounds, there was the smell. 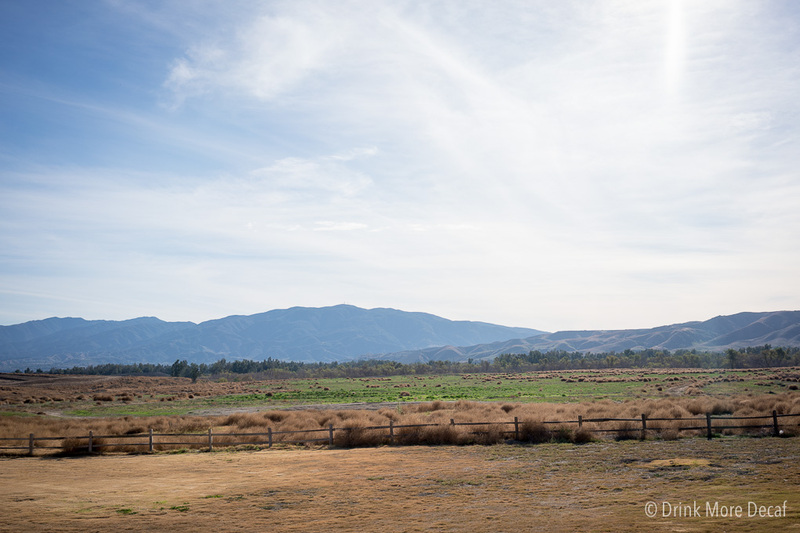 Have you ever been near a dairy farm? There are several in Chino, quite a few right near the Prado Regional Park. For most of the day the smell was so bad we were unable to use our fan or open our windows. In fact, you can smell cow manure as you drive around Chino. Feel free to knock this city right off your to-visit list. 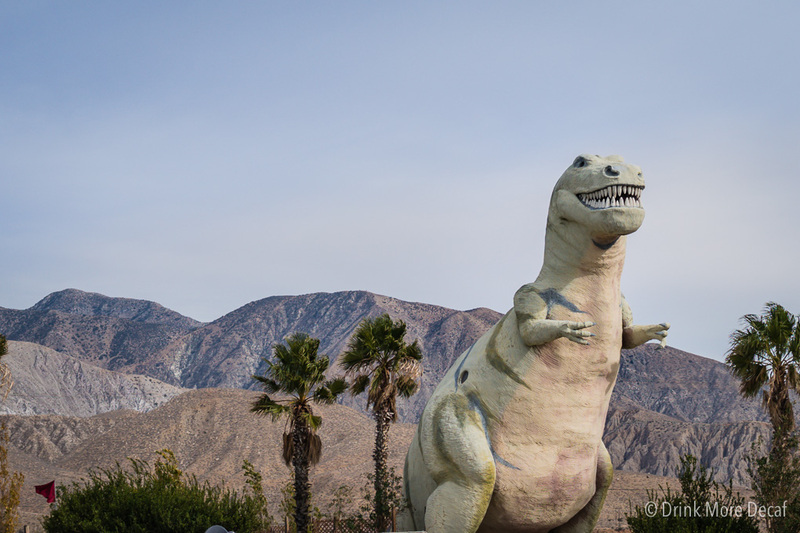 Oh, but of course, we weren’t in Chino to sightsee, we were there to have our hot water heater system replaced – which we did. We have working hot water now! It’s a miracle! I have another RV Repair shop to recommend, thoughts to share about our experience of going a full month without any hot water, and tips about how to go about having your hot water system replaced – all… coming soon. For a few more days we are kicking around near the shop where had our hot water system replaced, just to continue testing and make sure all is well before we depart. 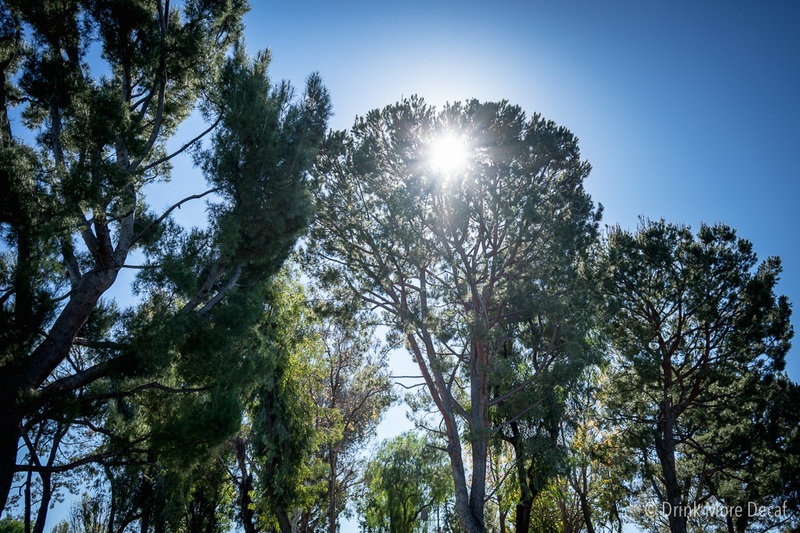 Currently we are in San Dimas, California and though the current place is well above our budget, it is well worth the change in venue. Even Frodo approves! Hopefully the lack of gunshot sounds throughout the day will get me back into a writing mood so I can write more about the last week, and month. Our poor dog. 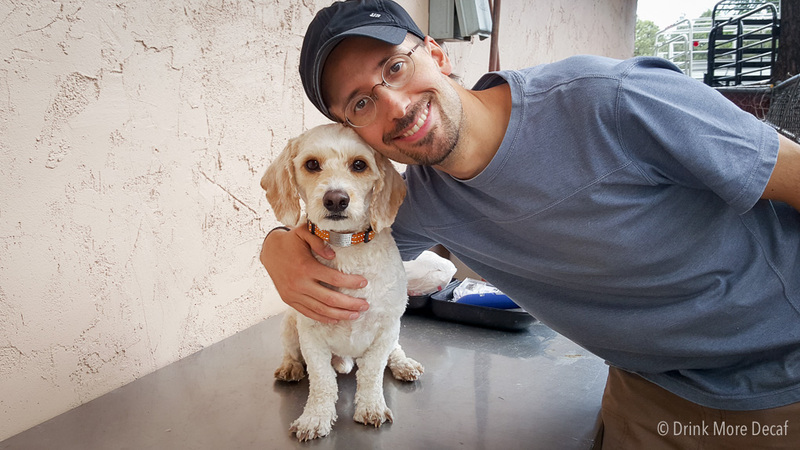 In the last few weeks we have traveled through Arizona, Nevada, California, and now Arizona again – and in that time he has not set his paws-to-grass. Thankfully he’s fairly adaptable and was able to adjust to rock gardens but still… he’s a dog! He likes grass! We were also quite busy moving out of one RV into another, in a very tight timeframe. I think Frodo was feeling neglected. It was way past time to get this dog to a DOG PARK! 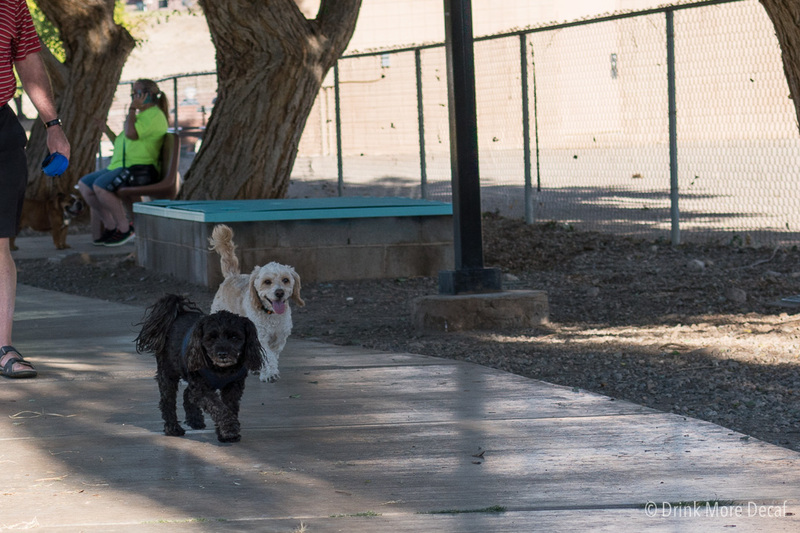 Thankfully, we discovered Lions Dog Park in Lake Havasu City, Arizona! The off-leash area was HUGE, and very well cared for – and – it has grass. In Arizona! Real grass in a dog park! 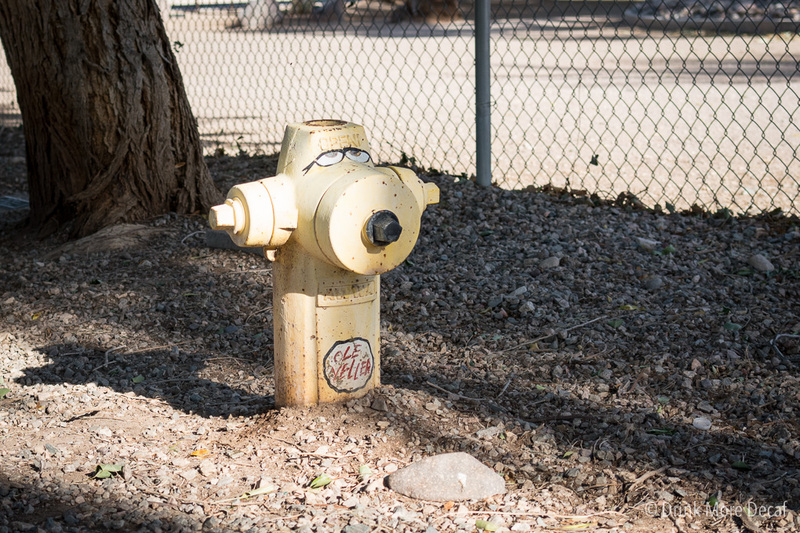 Sadly we’ve seen too many parks recently labeled “dog park” that were sand pits – um – that doesn’t count! It was really awesome to have such a large area where we were allowed to let Frodo just be himself. He’s very well behaved and loves socializing (in the photo below, he had just greeted the man on the bench, before running back to us). And Frodo makes friends everywhere he goes, this was just one of his playmates today. Since Frodo got to run and greet people and dogs, he was able to wear himself out from play. It’s a great thing to see him tired from playing! A tired dog is a happy dog! 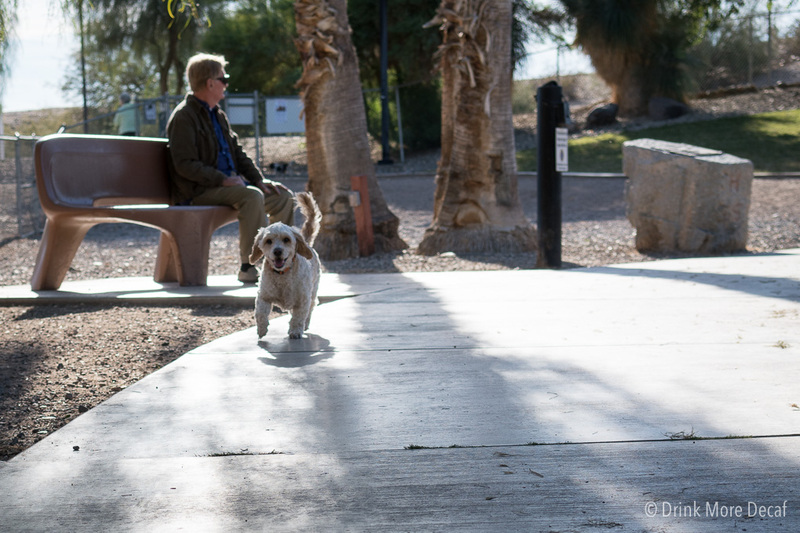 We may stay in Lake Havasu City for a few days so I hope to have an opportunity to take him back to this park. 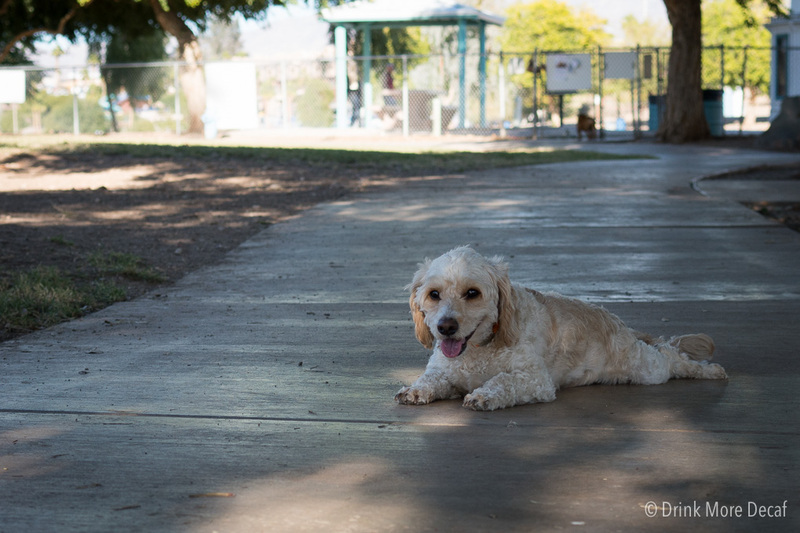 If you are traveling with your dog, Lions Dog Park a must-visit park! Frodo gives it 4 paws up! For real, he’s sleeping on his back snoring right now, all paws in the air. It was really nice to give him a good play day!